My Grandad Roland Knight had 3 stalls in Church Street market. He sold vegetables, fruit and salad. The stalls were on the corner of Church Street and Penfold Street opposite Ivanson's the Chemist. Various members of my family worked on the stalls, best known were George, Bella and Rose. 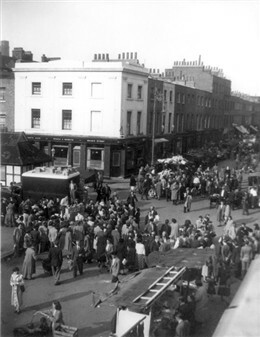 My Dad told us that circus animals used to pass through Church Street on their way to perform at the Metropolitan. The animals used to take food from the stalls on route. I lived in Salisbury Street where my Dad Roly had a Greengrocers shop. Sadly Roly passed away 2 years ago. I went to Gateforth School and Christchurch. Then on to Regent's Park and Sarah Siddons. My Mum and Dad bought household goods and clothes from Jordan's. Chocolate Joe had a shop but also sold from a stall in front of his shop. Rosin's the Bakers and Sidney's shoe shop were frequenty visited along with the Co-op. Many other shops come to mind, including Murrays the Butchers who sold hot saveloys and pease pudding on Saturdays. Many happy memories of growing up in Marylebone which was a very close knit community. I include this as a memory to my hard working family who manned the stalls daily in all weathers throughout the years. This page was added on 16/04/2011. My father and his twin brother went to Gateforth Street School, you could see the playground from my nan's kitchen window - fond memories. I remember the fantastic apple fritter stall in Church Street... molten apple inside a red hot fritter... tons of sugar... bliss! Also wonderful business-generating idea by local dentists! My Grandad (Jack Clancy) had a fruit and veg Stall outside the cinema in Church Street in the 20's and 30's. He was gassed in WW1 and had to take an outside job so that is what he did, he used to give us kids a bag of peanuts (in their shells!) to take in to the pictures. We paid 4d to sit in the circle and I am ashamed to say that we used to throw the shells down on the stalls below. I was fascinated by Tubby's seafood stall which was outside Roisin's the bakers. I used to hate seeing the live eels being chopped into bits so that people could make their own jellied eels. I only tried jellied eels once when I was in the Duke of Clarence in Frampton Street with mum and dad, they are an acquired taste which I didn't acquire, so I have never tried them again. Only now do I appreciate looking back on my childhood. What lovely memories I have. Being able to play in the streets. Being able to go to the shops. We could not let our kids do the things we used to do.